The age-old question, that afflicts new college graduates, senior executives, and foreign applicants alike: how long should my resume be? The dynamics of the question have changed significantly in the last few years, as online application and electronic resumes have become the norm. The problem with the question is that it’s not framed properly. For people who prefer certainty, the real answer is disappointing: it depends. 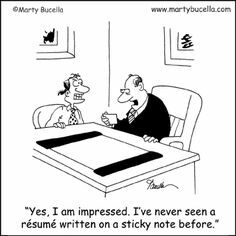 In some cases, a long resume will do you no favors but in other cases, being too brief will cripple your chances. Online Applications: When you’re submitting your resume to a company website or online job board (which is generally not the best way of approaching a company or job, though probably the most frequent), it pays to know your audience: the machine. ATS machines are fickle, easily confused entities, so it pays to keep format and length to standard when dealing with them, lest they spit you out with asterisks and hissing. And since your resume, in this case, will be stacked on top of myriad others being submitted via the same portal, getting your foot in the door would be better served by being brief, concise, and neat. Human Resources: The bane of the modern corporate world (unfairly, to some extent), the HR professionals set to watch the outer walls of each corporate citadel are frequently overworked and tasked with sorting through thousands of resumes for jobs that they may or may not understand (and likely have never done), in order to meet metrics that may have nothing to do with department needs. In that environment, anything out of the ordinary regarding your resume (typos, excessive length, improper formatting, too many exclamation points) is likely to send it into the black hole instantly. College Graduates: Someone just out of school will probably have a shorter resume, naturally, and one page tends to be the standard for college graduates or entry-level professionals. While it might seem like a good idea to dredge up every job you’ve ever done back to fry cook at McDonald’s, searching for those oh-so-relevant “cross-functional” and “intangible” skills, or adding all of your personal interests, if it ends up padding your resume beyond one page, it’s probably better to leave it off, especially if it’s not strictly related to the position for which you are applying. Hiring Managers: Once you’ve managed to get past the gatekeepers and your resume into the hands of the person you will likely be working under, they will probably want to see something far more extensive than just a one-page summary. 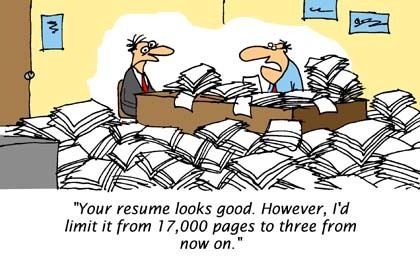 Since at this stage, they aren’t sorting through a stack of 1000s of resumes, it will be coming down to a choice between just a few candidates, and having those extra details could make all the difference in being chosen for the position. If a Tax Director, for example, knows the department will be needing someone with FAS 109 experience, but of course HR didn’t include that in the job description, and you’ve got it on your resume, even though it may have seemed a minor thing, that could be what seals the deal. But since they are working directly with Hiring Managers on many occasions, they will probably not be interested in short resumes either, since all the details you provide could be what determines whether you’re selected for an interview (and whether they get the commission). Referrals: If you have a former colleague, manager, or friend who can get you the inside track on a new role, it pays to have something more detailed at the ready, since it’s going to be read directly by the person responsible for hiring. Format: In addition to situations where the person you are sending the resume to makes a difference, there also comes a point when you just can’t fit it on 1-2 pages anymore. A few lines just seem to fill out onto the next page, no matter how precise you are, leaving a big empty white space at the end. And no one wants to read tiny 8-point font with the margins shrunk almost to the page borders… and the game of decreasing font-size and zooming in Word might seem like a good idea until the person on the other end tries to import into an ATS system or print it. So in that case, a longer, fuller resume would be preferable to an empty white page, something important cut out, or formatting tricks. Career Length: Obviously, the further in your career you are, especially if you’ve worked at many jobs and at many companies over the years, the longer your resume will be. A finance executive would have almost no space left for anything but titles if he restricted his resume to one or even two pages. So what’s the bottom line? You’ll probably need a short and a long version of your resume, depending on who you’re sending it to and at what point in the process you are. There may never be a need for a CV style, exhaustive treatise on your entire professional history back to your paper route and yard work and the articles you wrote for your high school journalism class, but it would pay to have an extended version with more details available just in case a recruiter or hiring manager wanted to see more before an interview, after the screening process matured to a later phase. That one extra line could make all the difference. This entry was posted on Wednesday, August 3rd, 2016 at 6:55 pm	and is filed under resume writing. You can follow any responses to this entry through the RSS 2.0 feed. You can leave a response, or trackback from your own site.